To Concierge or Not to Concierge, that is the question? : What is all the fuss about? Tigger Travels - Family Adventure Journal Photos From Tigger`s Travels and MORE! On most of the cruise lines they have cabins or suites with a higher level service available, of course, at a higher price. Disney Cruise Line is no different. For our 15th anniversary I convinced my husband to do something really special and we decided to try one of these concierge rooms on the Disney Dream. Now keep in mind that I am cheap and I watch for travel deal and discounts weekly. This is my logic, if I book the cheaper rooms I can go on more cruises, so this is a very big deal for me to go from our standard outside room with a port hole all the way up to one of the fancy set ups. 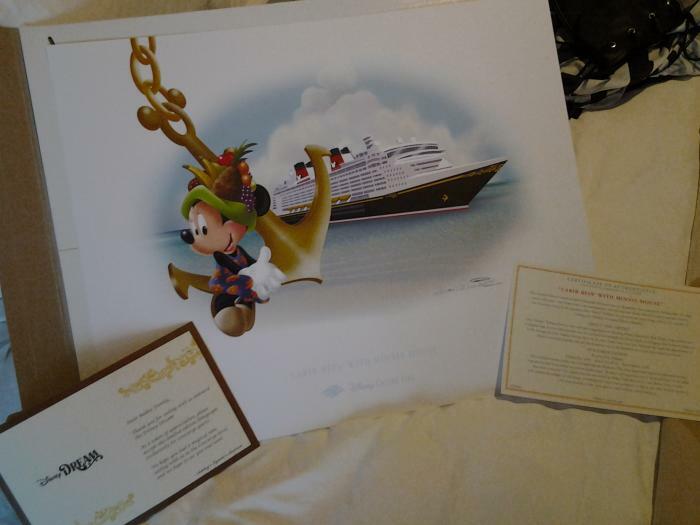 In my quest I found a 4 night cruise on the Disney Dream that was reasonable enough that it didn't give my husband a heart attack but we still got to experience all the special perks that come along with the concierge level stateroom. And here is the story, when we arrived at the terminal we found a special area to check in and were immediately escorted onto the ship by a cast member to an elevator to take us up to the concierge lounge, bypassing every line. 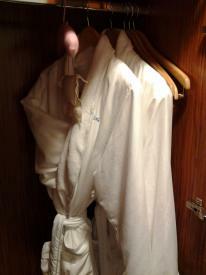 I must admit is was very cool, we got there during initial boarding and��it didn't matter we went right on the ship. Gift os a lithograph at the end of the cruise. get a little nervous because my first stop when we get on board is to get my Palos and Spa reservations, I am worried I am not going to get the time slots I want. I mention this to our concierge rep and she waves her magic wand (actually her hand and calls over a member of the Palos team and the spa representative to make my reservations and I did not have to move a muscle. (Yeah, I could get used to this... and I did.). forward in the adult area on decks 11 and 12, near the spa and adult pool, which is exactly were I wanted to be. We were told that the lounge is open from 7am-10 pm and has daily food set ups with Continental breakfast, lunch snacks, afternoon snacks (including tea and scones) dinner snacks and bedtime deserts all throughout the days. They also offer Tea, Soda, Coffee, Hot chocolate and Cold water all day long (Basically, anything you can get at the drink station you can get in the lounge). 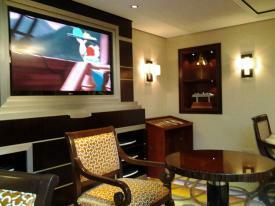 The lounge also provides iPad rental, access to DVDs, board games, magazines and the nightly menus to get a sneak peak. I realize that all this is available in different areas of the ship, but once again cruising concierge is a 1 stop shop for everything you might need. In the evenings comes the pre-dinner cocktail time, where you can get beer, wine, mixed drinks and more. We loved this time we got to chat with other cruisers, share a drink and just socialize. Its a fantastic way to start our evening's entertainment. 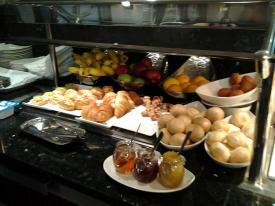 Oh yeah, did I mention it is complimentary? Another service provided you get 1 complimentary medium sized Internet package. Yes, it is part of the concierge experience. Overall, Disney service is always impeccable no matter where you stay but our 3 concierge staff members, Lynda, Ashley and Andreia really made us want for nothing, from handling all of our guest services needs, to handling special requests and just completely taking care of us 24/7.��It really made our 15th anniversary special and with all the freebies we actually came home with money, that has never happened to us before. 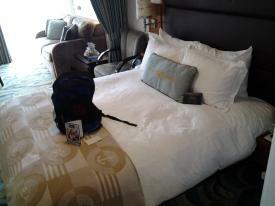 A lot of space around the large bed with a gift for returning cruisers. Will we ever cruise concierge again? Absolutely, especially realizing the value that all the perks added up to, the price is not far from what we usually spend! I will not 'concierge' every time, but I will definitely not rule it out when looking for that extra special trip.